I've been to neighborhood meetings in the last few weeks and several new business' are coming to South Boston in 2011/2012. At the Andrew Square neighborhood meeting, Subway made a proposal to put a new "restaurant" at the intersection Old Colony and Dorchester where AT&T Mobile used to be. Most of the neighborhood was in support with a few members desiring a more trendy South End type of restaurant. 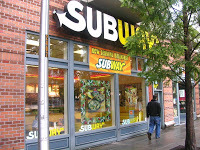 It looks like Subway will be moving forward and they hope to open by the end of the year. At the West Broadway neighborhood meeting, Starbucks and Social Wines presented. Starbucks is slated to open at 11 West Broadway. As some of you may have seen this week, the developer just started tearing down the old Quiet Man Pub and other buildings where the development is being built. Construction will include 50 apartments for rent and I believe 2 commercial spaces for rent. Starbucks will be opening in one of the commercial spots, and I've heard that another Subway is slated to open in the other space. Social Wines is looking to open up at 50 West Broadway at the corner of A Street in South Boston. This sounds like a great business for the area. I've heard the landlord/owners of 50 West Broadway are difficult to negotiate with as there was already a wine and cheese bar in plans last year, but the deal fell thru due to the landlords high rent demands. Last updated April 25 at 12:19 am.